Voice your opinion! Review Enviro now. Enviro is a quite reasonable brand with high-quality service of electronics. Their customer support is really good and responds on time. I am using Enviro ac & Microwave and it's doing great. 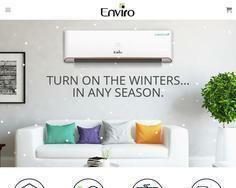 Buy Home Appliances in Pakistan at enviro.com.pk. Make your life easy by using domestic or electronic appliances in the home. Order Home Electronics Online at best Prices in Multan, Lahore, Karachi, Islamabad and All across Pakistan.